As most of you already know (judging by the scarcity of available hotel rooms in the area), the bi-annual festival is starting on June 9th. 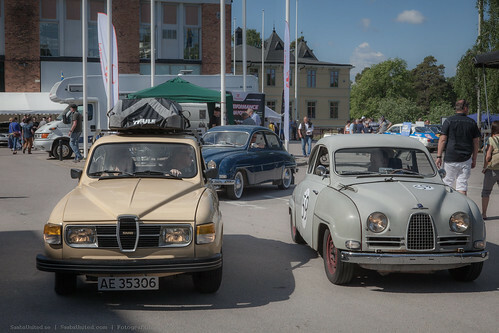 For three whole days Trollhättan will be filled with Saab aficionados and fans. I thought it would be the 9000 Talladega run in focus this year, but I guess I was wrong. If you have not attended before, what you can expect is thousands of fans gathered in and around the museum (the main hub of this event). At other locations in Trollhättan spare parts can be found (and/or harvested for more vintage models). Tip: Get there early! There are even some professional vendors trying to get in on the action so they can sell you the same parts at a significant markup later. I.e. good bargains can be struck. Various Saab veterans are milling about the event as well. Lots of great stories straight from the horse’s mouth! Incidentally, the museum usually staffs a veteran outside these events as well, but it is rare to get so many in the same spot. The festival’s biggest “problem” is that some events take place simultaneously so it is difficult to cover it all. There is usually something of interest for everyone. Anna and I often get a kick out of spotting Saabs in contemporary TV shows. The Big Bang Theory is one of the shows we never miss, and one of the main characters (Leonard – the most normal one of the bunch) drives a sleek-looking 9-5. Usually they only show a glimpse of his 9-5, I guess to make it less obvious that most of the time they use a green screen to provide the background. However, this week’s episode was filmed on location, and several great shots of Leonard’s 9-5 was shown. The 9-5’s Saab logo on the hood nearly burned a hole in my screen. People not driving Saabs every day are more likely to punch you in the face. However, they can also provide a great source of entertainment. Three guys who used to run a popular car show have formed their own facebook group. A good friend and allround decent chap, Johan Bohlin (yes, the Saab ice cream guy) wanted to show his support for the factory and started a new facebook event: We Support Saab. It is a virtual event (and at the moment very low key), so no need to go anywhere physically, but maybe it will be a good idea to find a nice place to visit (in your Saab of course) and just enjoy the day? It can also serve as a mental preparation for this year’s Saab festival. We will be attending the festival and look forward to seeing you all in Trollhättan. One has to say that these are historic shots. Four 9-5 II Sport Combis in one place will remain a rare view. The reason for the meeting was to get those cars street legal. An issue that Saab Service Lafrentz has earned a lot of experience in recently. On that day the three visiting Combis (from Sweden, Switzerland and the Baltic region) got all approvals to get registered for road use. UPDATED – Saab Festival in 2011?…….NO. I’ve checked with Peter at the Saab Museum and can pass on to you all that there will not be a Saab Festival in 2011. Festivaliers should therefore keep their eye on the 2011 IntSaab gathering in Finland, where registrations are now open. I only came to know about the Saab Festival in 2007, when I attended my first one. As I understood things then (and I could well be wrong on this), the Saab Festival is held every second year. If that’s the case, then the possibility of a Saab Festival in 2011 is an interesting one. Why? The 2007 festival should have been followed by one in 2009. In 2009, however, Saab were being held up against a wall with a knife at their throat. Money was tight and there was seemingly little to celebrate, so the 2009 festival was cancelled and replaced by a smaller “Saab Days” event, which was more of a local gig. With Saab reborn, a Saab Festival was held in July 2010. I think you can do the math here. If they retain what I understood to be their normal pattern, we could expect a Saab Festival again in 2012. Here are some video highlights from the celebration of last year Saab festival. Who’s planning to visit the Saab festival in Trollhättan, Sweden this summer? This is fantastic news, obviously, just a little bit surprising. There’s nothing on the Saab Festival website yet. If I find out anything further, I’ll update you all here. The Facebook entry linked to this video from the 2010 Festival. It’s worth watching if you’ve got a minute…..
Hey, what can I say? I’m blushing again. Trollhättan, Sweden: Saab Automobile, now moving forward as an independent premium carmaker, is to present an annual achievement award to any individual who makes the most outstanding contribution to the success of the brand. The first winner is Tasmanian Saab enthusiast Steven Wade, who received the award in Trollhättan from Saab Automobile CEO Jan Åke Jonsson and Chairman Victor Muller. Steven, a 40 year old auditor, founded the SaabsUnited website and played a lead role earlier this year in rallying global public support for the company during negotiations for its sale by General Motors. In recognizing Steven’s enthusiasm for the brand, Jonsson said the annual accolade would be known as the Saabs United Award. It will be open to any individual, a customer, member of staff or anyone who makes a special contribution to the Swedish brand’s success. Each year, Jonsson will lead a small judging panel of Saab executives to decide the winner. The following videos have been published on YouTube, on Saab’s official channel. It’s the full “Top Notch” presentation made by Peter Backstrom and Christopher McKinnon. It was modelled (loosely) on the BBC program Top Gear, using that show as an inspiration for the setting and atmosphere. This year’s Saab Festival recognised the 50 years that have passed since the inception of the Saab 96, hence the focus on that model in early parts of the video. Other segments include a look at the Mille Miglia, an interview with Mr Saab, Erik Carlsson, a little bit with yours truly and Claes Robertsson about the Saab Support Convoys and a few other bits with Vladimir Antonov and myself at the end. I hope you enjoy the show. Personally speaking, it was a pretty special evening, but then any evening at a Saab Festival is just that – special. There are 16 episodes in all. Part 2 – Intro of Peter Backstrom, Christopher McKinnon and the Mayor of Trollhattan, Paul Akerlund, who delivers a very gracious and heartfelt message of thanks.